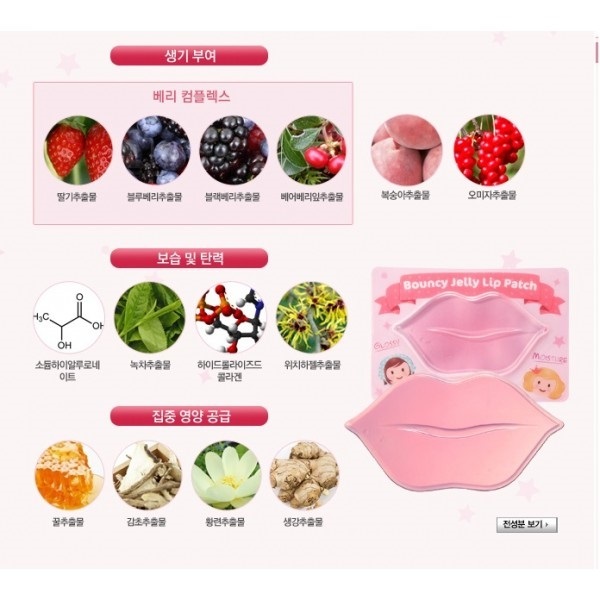 Shara Shara Bouncy Jelly Lip Patch this hydrogel lip mask with a berry complex that contains vitamin and various mineral and with peach extract take care of dry and dull lips and skin around mouth. Natural moisturizing ingredient such as hyaluronic acid and honey extract and licorice root extract permeate are penetrated into the gap of rough lips and help care resilient and healthy by supplying intensive nourishment. This mask creates moisturized and resilient lips. Lips shape of gel patch in large size covers not only dry lips but also all over dull mouth to soothe sensitiveness. Cooling feeling offers pleasant tension to create smooth and flexible lip skin. 2. Open a package and pull out the lip patch. Fit to lips. 3. After 10-20 minutes, remove lip patch and pat the remainder essence lightly with hands for absorption.